A few weeks ago, I wrote about our trip to the Konza Prairie Biological Station in eastern Kansas. On that trip, we learned about research results showing that frequent spring fires (one or two year frequency) can prevent encroachment of tallgrass prairie by trees and shrubs. Less frequent fire allows shrubs, especially dogwood and sumac, to invade. Pretty simple – we should be burning tallgrass prairie at least every two years, right? Hang on just a minute, Sparky. As you might expect, there is more to the story. It turns out that the frequent spring fire (with no grazing) regimes at Konza has other impacts. One example is that frequent fire favors grasses over forbs and decreases plant diversity over time. Prairies that are burned every year or ever two years develop a grass-dominated plant community in which many forb species are difficult to find. So, frequent fire is bad for plant communities… Right? Annually-burned tallgrass prairie at Konza Prairie, in the Flint Hills of eastern Kansas. August 2014. But in other tallgrass prairies, especially in more eastern prairies such as those in Illinois, researchers are seeing very different impacts of frequent fire. A paper by Marlin Bowles and Michael Jones, for example, found that frequent fire “stabilizes” plant communities in the Chicago, Illinois area, and that plant diversity was positively correlated with fire frequency. In fact, their results are almost the exact opposite of what was seen at Konza. In the Illinois study, frequent fire decreased the dominance of warm-season grasses and increased the diversity of summer wildflowers. If we could answer that question, we’d be miles ahead of where we are now in terms of understanding prairie ecology. I can come up with lots of potential reasons for the difference between frequent fire application in Illinois versus Kansas, but I can’t confirm or deny any of them – we simply don’t know. As I think about why prairie plant communities might become more dominated by grasses over time, I wonder about factors such as small scale plant diversity, soil productivity, and the soil microbe community – all of which may correlated with each other. Eastern remnant (unplowed) prairies tend to have a higher density of plant species (e.g., plant species per square meter) than western prairies. High species density could potentially help suppress grass dominance because of the variety of competition strategies each of those plant species employs to take and defend territory. Those strategies include allelopathy (releasing chemicals that retard growth of nearby plants), rhizomes (underground stems that can connect even fairly distant stems of the same plant together), root density/depth, and many others. It seems logical that communities with that kind of well-established complex competitive environment would present a major challenge for any species (grasses or otherwise) trying to become dominant. Maintaining consistent growing conditions by burning or haying annually might facilitate stability within those plant communities because it essentially maintains a stalemate; no plant species is ever given a window of opportunity to gain advantage over its neighbors. Or this could all be balderdash – I’m just throwing out ideas here. Does the rich soil organic matter content of eastern tallgrass prairies help suppress grass dominance? It’s probably the major reason for the higher plant species density in those prairies, so maybe. On the other hand, research at Konza and elsewhere in more western prairies shows that adding nitrogen to prairies (increasing productivity) increases grass dominance and lowers plant diversity. Hmm. Those of you who read this blog frequently may be surprised that I haven’t mentioned insects or other animals yet. Let’s talk about them now, shall we? 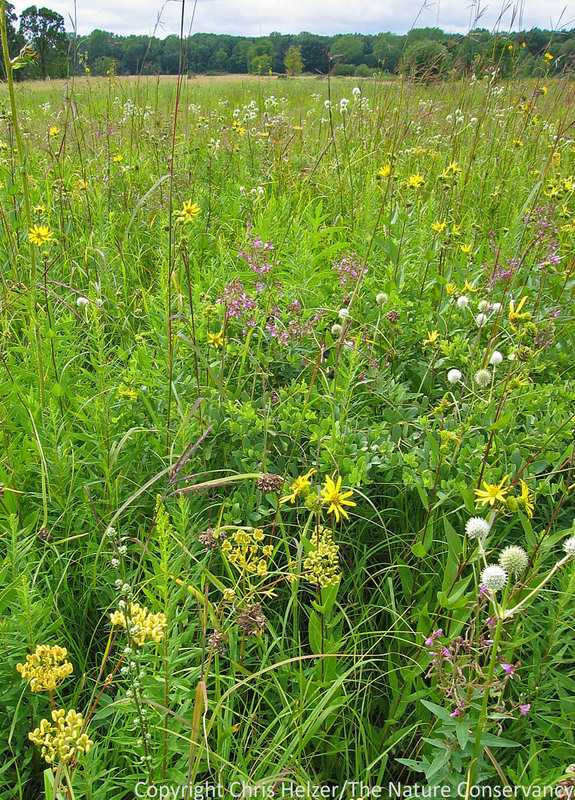 It’s very important to remember that even if frequent burning seems to maintain high plant diversity in (some) prairies, a prairie is much more than just plants. The use of frequent fire tends to create fairly homogenous habitat conditions across a prairie. Regrowth rates are similar across the whole burned area, so vegetation height and density is relatively uniform. Dead material, including both litter and standing dead vegetation, is scarce. Because habitat diversity is limited, so is the diversity of creatures that rely on that habitat. In taxonomic groups ranging from grasshoppers and spiders to mice and birds, research shows that habitat diversity is positively correlated with species diversity. Creating habitat heterogeneity – through grazing, patchy mowing, or other means can help facilitate a more diverse animal community. Burning in a less regimented way can help too, especially if that means splitting a prairie into multiple management units and burning only a subset of those each year. Heterogeneous habitat structure, including tall, short, and mixed-height vegetation – like that shown here – can help maintain diverse invertebrate and wildlife communities. Grazing is one great way to manipulate vegetation structure, but isn’t feasible at all sites. Grazed prairie at The Nature Conservancy’s Platte River Prairies, Nebraska. In small isolated prairies, it’s also critically important not to burn (or mow) the entire prairie at the same time. With limited opportunities for species to recolonize from other prairies, a fire that kills all of the individuals of a particular species (e.g., an insect that overwinters in the stems of grasses or in the litter along the ground) can mean the end of that species’ existence in that prairie. Maintaining a floristically diverse prairie without a full complement of invertebrates doesn’t seem like success to me. On the other hand, I also appreciate the difficulties associated with managing small prairies. To wrap this up, I think there are two really important points to make about fire frequency in prairie management. First, there are some big questions about why frequent fire seems to maintain high plant diversity in some prairies but encourages grass dominance in others. Figuring out the answers to those questions may be one of the more important keys to prairie conservation success. Second, even if frequent fire maintains high plant diversity and repels invasion by shrubs and trees, it still might not be the best choice for a prairie management strategy. 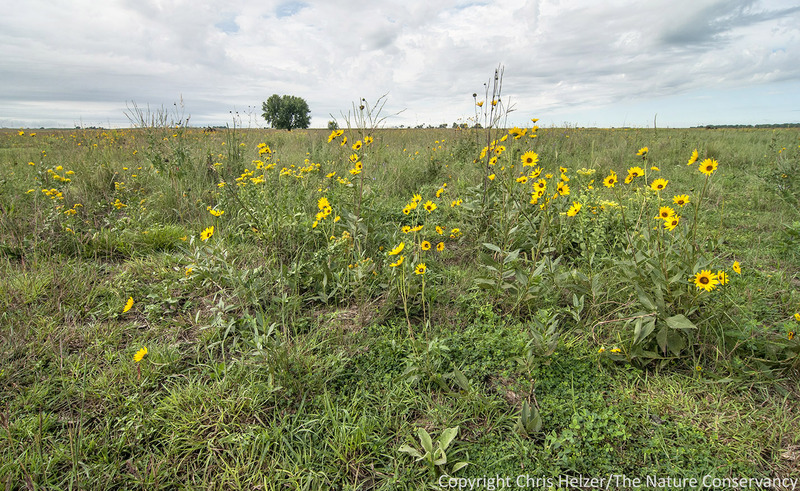 There is much more to a prairie than its plants, and even if you don’t much care for invertebrates, birds, reptiles, or mammals (and how could you not?) those species – especially the invertebrates – are strongly tied to the long-term viability of the plant community, so it’s probably not good to ignore them. To be clear, I’m not saying people who use frequent fire are evil destroyers of animals. I’m just raising a flag of caution and pointing out some potential tradeoffs. 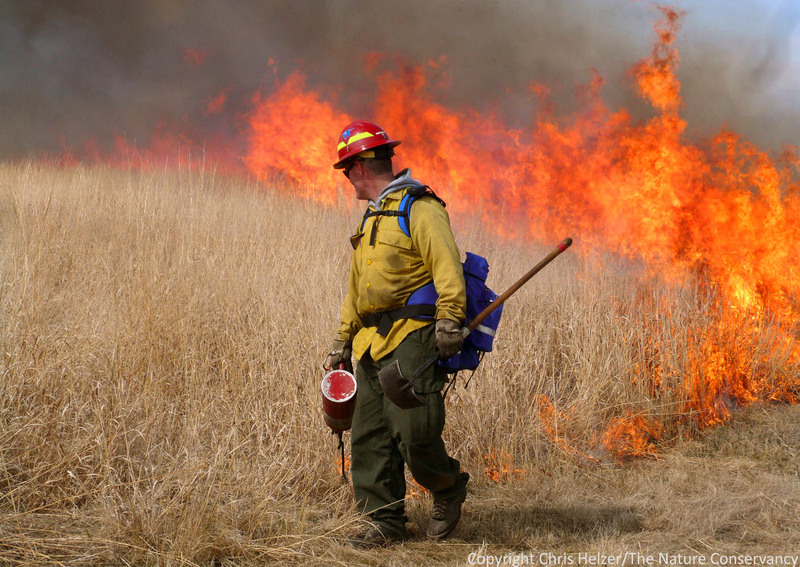 Prescribed burning is a valuable management tool, but its impacts on prairie communities can be complicated. It’s important for prairie managers to recognize and account for both the negative and positive impacts of fire. Those of us who work with prairies are used to the seemingly overwhelming complexity of grassland communities and the way those communities respond to management. 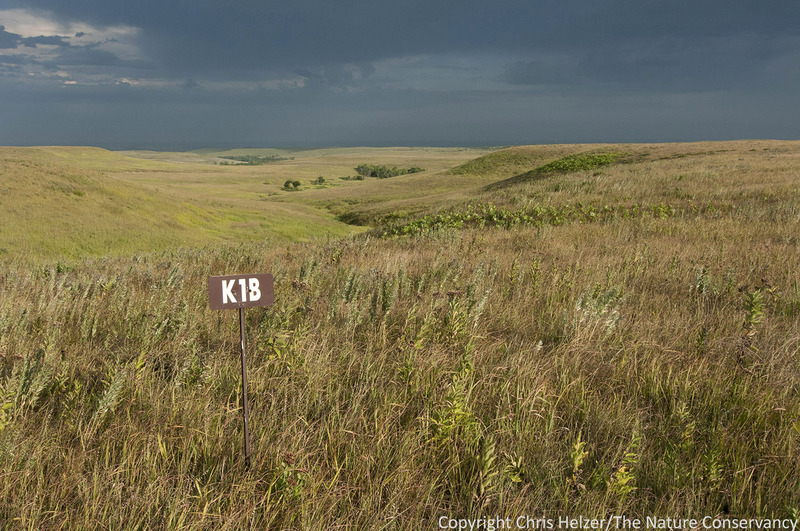 In fact, for many of us, it’s a big reason we love prairies as much as we do. While we still have more questions than answers about effective prairie management, we have enough information to go forward with. Most importantly, prairies are pretty tough, so excepting drastic measures such as broadcast spraying with 2,4-D (and maybe burning an entire tiny prairie), we have the latitude to try out lots of ideas and see what works. We’ll learn as we go. In the meantime, it’d be great if all you researchers out there would get cracking on the issue of disparate effects of frequent fire in eastern versus western prairies. It should only take a few decades to figure it out… Right? This entry was posted in Prairie Insects, Prairie Management and tagged controlled burn, dominant grass, fire, frequent fire, grass, konza prairie, plant diversity, prairie management, prescribed burning, prescribed fire, research by Chris Helzer. Bookmark the permalink. The single most obvious difference between eastern and western prairies is amount of precipitation, yes? And then elevation? What differences do rain and elevation make? Priscilla – you’re right that precipitation is very different, and that could sure have an impact. On our trip to Konza, we learned about the ability of grasses to compete strongly with forbs for shallow water (top 1/2 meter of the soil profile) during drought periods. That could sure contribute to the ease with which they can gain dominance in drier western prairies – especially during drought periods. Whether or not that is related to the response of the plant community to fire is a question I can’t answer. I’m not sure whether elevation is important or not. I sure won’t say it isn’t! Thanks for the comment. Precipiation at Konza is actually only slightly less than that in Iowa or northern Illinois. However, the shallow bedrock and warmer temperatures at Konza affect how exposed plants are to drought stress. I think diversity happens where resources are largest. In the east we have too much water. The rain washes away soil nutrients. Burning in the east increases evaporation from the soil which prevents loss of resources (nutrient limited). Burning also increases another limiting resource in the east (light). In contrast, the rainfall sweet spot to maintain soil nutrients occurs in eastern Nebraska. However, after rainfall is reduced beyond a certain point then water becomes the limiting resource. When conserving water becomes more important than increasing nutrients or light then the thatch is a diversity increaser by helping preserve the limiting resource (water). It should not be surprising that ecosystems facing different limitations would react differently to the same management actions. Your statement is true. However, fire returns phosphorous to the soil which greatly increases fixed nitrogen production. Since fixed nitrogen can be synthesized, I do not think fix nitrogen limitation is the problem so much as the plants ability to absorb nutrients. Leached soils tend to be more acidic which can prevent plants from absorbing nutrients. I also wanted to add that my experiences with northwestern Illinois restorations differ with those of Marlin Bowles and Martin Jones who studied only prairie remnants. In a restoration on thin soil over glacial till, a habitat that is much like the Flint Hills, I have observed a marked decrease of forbs and increase in grasses after the commencement of a biannual burn regime on a site that had not been burned for eight years. The observations made at Konza may not always apply to areas further east. This is especially true if the Konza data is compared to observations from a black soil prairie. However, I believe the Konza observations can apply to sites in Illinois when the habitats and species compositions are similar. I have a crackpot hypothesis about why fire has different effects on warm season grasses vs. forms on many eastern prairies. Many of our eastern prairie C4 (warm-season) grass contingents are made up more of little bluestem and prairie dropseed, which are caespitose than big bluestem, indiangrass, and switchgrass (more dominant at Konza and rhizomatous). Even many wet-mesic prairies in the east have more little bluestem than big bluestem. Caespitose grasses have a fundamentally different architecture. They also have a reserve a perennating organs that are more vulnerable to damage by fire (though most research on this is on western bunchgrasses that are damaged by fire and replaced with annual exotics). I’m not saying that I think fire hurts the C4 bunchgrasses, but I think the net of its primary and secondary effects on them is LESS beneficial. Just a guess…but I think the species ID of the C4 grasses involved is important. Makes sense to me as far as it goes. But why are eastern prairies less dominated by big bluestem in the first place? Could the diversity or abundance of hemiparasitic plants or fungi that derive some of their nutrients from grasses be greater in the north and east than in more western prairies? Perhaps they are able to counteract the stimulatory effect of fire on grasses. Just a thought. I have downy yellow painted cup, toadflax and slender false foxglove on my prairie, and the areas where they are found tend to have shorter grasses and less big bluestem and Indian grass than in similar areas where they are absent. One thing I haven’t seen mentioned in this discussion is the difference in timing and intensity of the burn. Ecologists (myself included) often fall in the habit of treating fire as fire as fire. Some of Rob Mitchel’s earlier work indicates a difference of as little as two weeks in timing burns can have a dramatic impact on the resulting vegetation response. Additionally, could the eastern prairies have differences in vegetation production, thus increasing fuel loading and fire intensity? I truly believe ecologists have had such a hard time quantifying large scale effects of fire because we have largely made the assumption that all fire is created equal. Certainly not the only factor but another piece to the puzzle. There’s a long history of fire research in southern Africa. Richard Fynn’s work at Ukulinga (small-plot burning trials, >50 years, 700mm rainfall) showed grass species richness declining with decreasing burning frequency, but forb species richness showing little effect on forb richness (but there was an effect on forb composition. At Brotherton (small plots, >20 years, 1300mm) we got significantly reduced richness with the annual winter burning, but the interesting effect was the heterogeneity among the three reps of the five-year burn. All the other treatments (frequent burn and fire exclusion) were fairly homogenous. Roger Uys, WIlliam Bond and Terry Everson looked at the effect of fire on species diversity across a rainfall gradient from 550mm to >1000mm, and could find no clear pattern of plant species richness response to fire frequency, but an obvious response to environment (especially rainfall). There’s also been work done on the Kruger long-term trials (rainfall gradient in lowveld savanna from >700mm to <400mm), which have been running for over 40 years now, and the Cathedral Peak Catchment trials (running since the 1930s). Worth looking into. Great info Alan! Thanks for sharing that. I wonder if anyone has ever done a meta analysis of similar research across all continents? I’m not aware of it if it’s happened, but it sure seems like it’d be instructive. Surely there is great information in Australia, as well as Africa and North America – I’m not sure how much fire is used as a management tool in European or Asian grasslands? I’m pretty sure there have been a couple of meta-analyses. One fairly recent one was by the guys from Konza (Alan Knapp and colleagues) with the crew from Ukulinga (Craig Morris, Rich Fynn and others). They weren’t specifically looking at diversity, though. The other well-known one from the 90s was the Milchunas and Lauenroth paper. I’d have to double-check whether they looked at diversity. William Bond would probably be a good one to check. I can look through my stuff and see what I find.